Tales told by my kids, some snippets of their conversation, and some tales of my own. On the playground yesterday there was a fierce display of sibling rivalry turned sibling on sibling on sibling crime. The details are not particularly important. The hitting, the chasing, the arm twisting, the throwing sand at “eyeball targets.” The look of horror on the faces of good-natured pacifist onlookers. I’m told it was embarrassing to watch the three of them go at it. So embarrassing for our dear 60 something year old Polish immigrant babysitter that she dropped her phone and left it at the park, only to have it picked up by a good Samaritan who turned it over to the police who in turn answered my call yesterday. “Hello ma’am, this is Officer Goodguy.” Triggering an internal shriek of what in the freaking hell?!? why are the police answering her phone…oh no, no, no, oh geez, nooooo! Thank goodness. Now back to the cause of the phone fumble. They were fighting. They were out for themselves, motivated by some good ole primal individualism. Yet, later that day their individual goals were upended because–the Olympics. I wrote everything you just read months ago as the 2016 Olympics kicked off. I’d come home after that phone call with the police, the one that still makes my stomach turn when I think about it. Of course it turned out just fine and the incident supplied a great deal of laughter during the round robin re telling by the 4 lead characters. 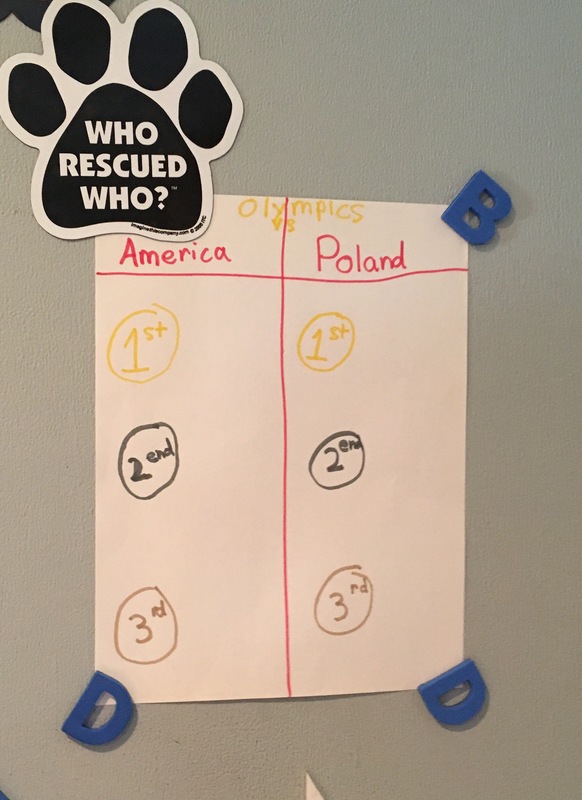 I found the picture on the wall too and was told that the kids were insanely excited about the Olympics and planned to keep track of how many medals the US and Poland won. I thought it was adorable and I thought it was emblematic of our tribal nature, and I thought for sure that the US would win more medals. I wanted to write a story about nationalism. How a healthy dose of nationalism can be a good thing. How petty grievances and playground sand-throwing can be set aside in the interest of something bigger than who we are as individuals, something that is more important. Then I thought about how dangerous it is sometimes. I thought about the downside of nationalism, of tribalism, of any kind of ism that separates us from others by telling us that we are better or more righteous or more deserving in some way. I wasn’t sure which side to come out on so I hit save as draft and moved on. Nationalism is good. Xenophobia is not. Flag-waving is okay. Jingoism is not. Nationalism is not an excuse to behave in a way that contradicts the very values that should be the source of our nationalism. Why do we love the United States of America? I can’t answer for you. For me it’s everything. It’s our insanely lucky start with a bunch of plucky flawed founders. It’s our freedoms of speech and religion and assembly and the limits we place on government intrusion in our lives. It’s our abundance of unlikely success stories and heroes, our fruited plains and purple mountain majesty, and people with revolutionary ideas in science and technology and the arts that heal and teach and employ and inspire. It’s the strangeness and difference. It’s the fact that my morning commute to work takes me through neighborhoods of African and Indian and Swedish and Vietnamese and Mexican immigrants and the opportunity to live in a place where my kids hear different languages everyday and where the 4:30 Saturday showing of Hidden Figures is practically sold out. And it’s the messiness and the parts that aren’t so great because they remind me that the work is not done. There are problems still to be solved. There is crime and there are bigots and there are seemingly impenetrable structural artifacts of our ugly history of slavery and inequality. There is corruption and there is heartache. Yet for my entire adult life I’ve believed that our system of government would provide a path for the resolution of these problems someday while protecting us from extremism on any side. I’ve built a career within a legal system that places the rule of law above all else. I believed that there were ground rules and boundaries. So much that I love about this country feels under attack right now. So much that it feels like everything. We are only a couple hundred years old. We are more fragile than I believed even a month ago. We are easily manipulated and we are scared. I believe that a great many of us are scared because we are being manipulated. But we also live in a remarkable age of technology and information. Facts can and should be checked. Books should be read. Stories should be told and heard and we should not be afraid to say what we believe. Civil discourse is part of what makes this country so great–and dissent, it’s positively patriotic. 10 and a half years. Next day. | The Good… on I hate sandwiches.